The raspberry crashes (reboot) often, mostly when controlling both the motor and the servo at the same time. Any idea why? I followed those instructions for the DC motor wiring. "The only thing is that I connected the 3.3V of the L293D on a 5V pin, but I assumed it is not a big deal..."
IT IS A HUGE DEAL ! Electromechanical devices are 1. power hungry 2. when initialized /started they are EXTREMELY power hungry - tech term is "power surge" 3. require "HARD" power source - tech term "power source producing SAME power (level) during initial power-up." Your RPi power goes bellow nominal 3.3V during your devices start causing it to reset. The solution Provide SEPARATE power for your motors. Make sure RPi outputs are ISOLATED from your devices - optocouplers works fine. Make sure your motors have BEMF "back electromotive force" protection - your hardware diver should do fine. 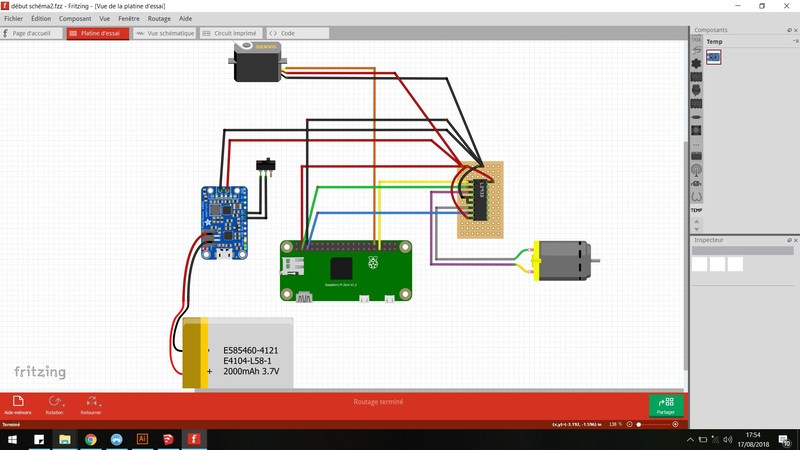 PS Next post do not spent time making fancy circuits layouts pictures - they do not grantee it is actually wired as shown and invite unnecessary criticism of your post. Your verbal post was all what was needed and you did good job. Not the answer you're looking for? Browse other questions tagged gpio python-3 servo dc-motor or ask your own question.